Van Asten Painting can clean up, maintain, protect, and beautify your older equipment by adding value and lifespan. If you have any questions about any of our services or if you have one not listed, please contact us to see how we can help you meet your company needs and goals. We provide coating inspections to determine any failures or needs for your facility and equipment. We have a Certified SSPC Protective Coatings Inspector Level II - #92796 available for your needs or designing paint specifications. Van Asten Painting maintains Technical Data Sheets and MSDS Sheets for all Paints, Compounds, and Solvents that we utilize in our business. These are available upon request. Lead-Safe Wisconsin Certified Company – #DHS-2051020. We are qualified to remove lead-based paint and abate lead-based paint hazards, to work on properties under orders to reduce or eliminate lead hazards, and on properties receiving federal or state funding to reduce or eliminate lead hazards. Van Asten Painting only uses the very best in Epoxy and Urethane Coatings to provide a durable long lasting finish to protect and beautify your investment. Decontamination of the concrete surface and diamond grinding to allow proper bonding of the Epoxy coatings to be used is essential to maintain a durable, long lasting floor. Depending on the coating being applied, a paint sprayer can apply a coating ten times faster than brushing and four times faster than rolling. When time is critical, this is your fastest option. For a consistent, long-lasting finish, you need to apply paint and coatings with high-quality application equipment. Better-quality brushes, rollers, and applicators tend to apply a thicker, more uniform, longer-lasting coat of paint. Van Asten Painting utilizes Power Washers to tackle your toughest cleaning needs, and sand blasters for surface preparation when needed before applying any coatings. Van Asten Painting can help your company facilities with Plant Blow Down and dust build up mitigation on structural steel and machinery. Van Asten Painting now offers Industrial Vacuuming services for most dry materials such as blast media grit, sand, and abrasives. 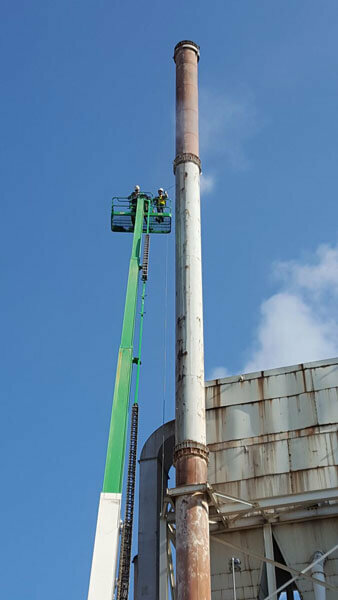 We can perform services with structural steel cleaning, clarifiers, silos, mills and quarries.